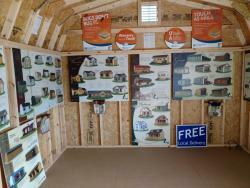 Pine Creek Structures in Wilkes-Barre, PA! We have over 100 buildings to choose from in-stock, some up to $750 OFF! If you don't see exactly what you are looking for, we can customize one just for your needs & budget! Our buildings are Amish-Made, so they will outlast all of our competitors and can even be moved if you decide to re-locate. We offer an idustry leading, 6-Year Top-To-Bottom Warranty on our heavy duty structures. We also offer FREE DELIVERY within 20 miles of the store if we can use our delivery truck and trailer. For tight yards, or difficult access, we have options! Call and ask Scott about the shed mule, Build on Site, or for a custom delivery quote. Here is a great video about our delivery truck. This is the Shed Mule in action. Give it a watch! If you come after hours, be sure to check out our Brochure Shed! From I-81 North: Take Exit 170B. Take Exit 1 off Route 309 (Cross Valley Expressway). Turn left onto Route 315 North. Pine Creek Structures is 1.8 miles on the right. From I-81 South: Take to Exit 175A. Follow Route 315 South for 4.1 miles. Pine Creek Structures is on the Left. 10x16 New England Cottage with Shiplap Siding!